Omera The Farm Stay offers mud huts with the comfort of air-conditioners. Their outdoor gym, organic garden and pool ensure that you can enjoy being in nature along with the promise of a well-appointed cottage to call it a night. Omera is a hidden gem where we can kick back and play board games through the day and sip beer in the garden at night. It’s also perched on the lap of the Aravallis, so it’s generally a few degrees cooler than your apartment complex. The Omera folks might not have been around for years, but they’ve been hosting parties, offsites and family picnics for a few months now. So they’re adept at taking care of the needs of very diverse groups ranging from bossy bosses to energetic kids. When you do land up here, we’d love for you to enjoy a wine-filled brunch and special organic brekkie. 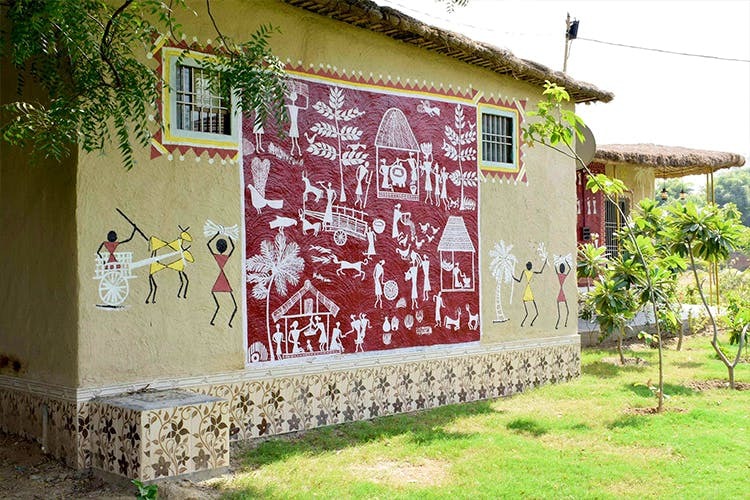 This is when you do want to leave those cutely, aesthetically done-up huts, full of Indian motifs and doodles. The all-white and teal furniture makes for very nice squad photos along with their amphitheatre was made for family portraits with their cheerful, brick design. The farm’s resident doggo loves belly rubs, and the ducks would love to have you name them. In fact, they are a pet-friendly space so you don’t even have to leave your own fur ball at home. The per night per room tariff is INR 5k, which for some, may be a bit on the higher side.